In our earlier article we have introduced you to Bluestacks App Player software which allows you to install Android Apps on PC. The program Bluestacks App Player is quite easy to install on your PC, like other normal programs which you install on your computer. But when you come across the situation to remove or uninstall Bluestacks from PC in Windows 10, 8.1, 8, 7 or vista it becomes difficult as you might get errors while the uninstallation process of Bluestacks and the process to uninstall Bluestacks from PC will abort in middle. Every Bluestacks App Player user might have also experienced sudden system slowdown after installing Bluestacks Software on PC so for that also we will be providing you a proper fix to troubleshoot the problem of delay or slow windows startup as well as system slowdown. While automatic updates of Bluestacks you might have been experienced that you have to remove the older version of Bluestacks App Player installed on your PC, and after successful uninstallation of Bluestacks when you try to install the latest version of Bluestacks you might get an error saying “A later version of Bluestacks is already installed. Set-up will now exit”. 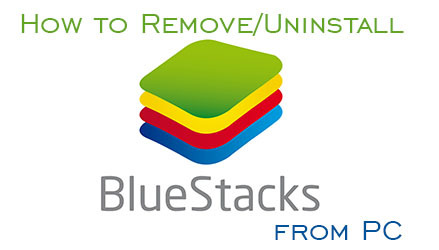 So in such situation you can use these below method to successfully remove or uninstall Bluestacks from PC completely. Download free version of CCleaner Software by clicking here and install it on your PC. Once the Software CCleaner gets installed on your computer, just launch the software. In CCleaner Software click on Tools tab and under Uninstall search for Bluestacks as well as BlueStacks Notification Center, and uninstall both of them from your PC. Once you successfully finish uninstalling Bluestacks App Player from PC, just click on Registry tab and click on scan for Issues and when the scanning process completes fix selected issues button will be visible click on that button once you click it will prompt you whether you want to backup registry if you want you can create a backup or else click on No and then click on Fix All Selected Issues. After cleaning the registry you have successfully completed the uninstallation of Bluestacks App Player from PC Completely. You might have experienced that after installing Bluestacks App Player Software on PC your system will usually get slow, as well as you will also see some delay in your Computer Start up to load your system completely. This is because of the Bluestacks Software as when your PC loads up the services of Bluestacks also loads up at startup which makes your PC to load slow on start up as well as it consumes lot of space from your RAM which makes your system slow. Below instructions will help you to troubleshoot the problem of Slow PC after installing Bluestacks App Player. Press Windows + R, this command will open the Run utility. Just type msconfig in Run utility and click on OK.
You will get small System Configuration window, in that go to Services tab and search for BlueStacks Android Service and BlueStacks Log Rotator Service and unmark both these services and click on apply (This will disable the Bluestacks services to run on startup which makes your PC to function slowly). Now go to start up tab and disable the Bluestacks Agent by unmarking it and again click on apply and click OK.
Once you click on OK, you will be prompted to restart your computer to see the changes click on Restart. After following these steps you will not face slow system when you are not using Bluestacks. As we have now disabled the auto-startup of Bluestacks which is not essential to be started on your PC startup. I already uninstalled it but whenever I open windows settings default apps bluestacks still remains there and there is also options such as “modify” and “uninstall” when I click uninstall it says bluestacks client uninstaller.exe and does not removes.